The Blake2s algorithm is a new entry in the crypto mining scene and while initially there was only CPU mining support available for it now there is also a ccMiner fork with support for Blake2s algorithm on Nvidia GPUs (source). 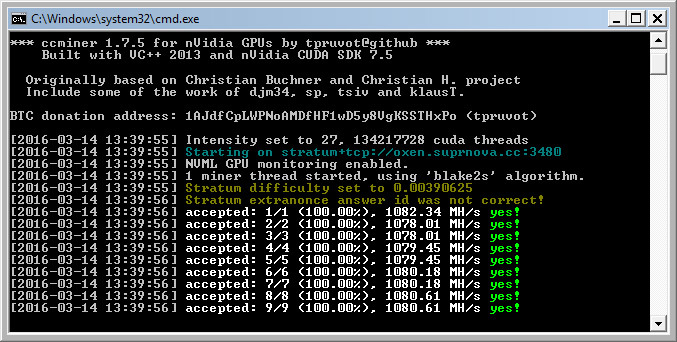 The initial CPU mining support for Blake2s was first introduced in cpumuiner-multi from tpruvot, though there is now a new more-efficient CPU miner available here. With the release of a GPU miner however CPU mining might be not worth it anymore, even though for the moment there is only GPU mining available for Nvidia-based video cards and no for AMD, but soon we are probably going to see Blake2s supported on AMD as well. 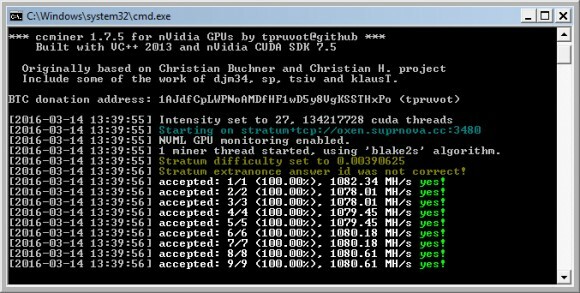 The miner below is a 64-bit binary compiled with VS2013 and CUDA 7.5 for Compute 3.5, 5.0 and 5.2 GPUs, a 32-bit binary compiled with CUDA 6.5 for Compute 2.1, 3.0. 3.5, 5.0 and 5.2 GPUs is also included. Do have in mind however that the 64-bit version of the miner seems to be offering better performance for mining Blake2s coins. Back to the ccminer 1.7.5 fork with Blake2s support. Our tests have shown that you can get somewhere around 1080 MHS for a Geforce GTX 970 GPU with a slight increase of the intensity over the default one, the power usage of the GPU while mining is about 168 Watts. For the moment it seems that there are just two altcoins that can be mined with Blake2s, but we are not going to be surprised if we soon see some more getting released. The first one is called NevaCoin (NEVA) and the more recent one launched yesterday is called OXEN. You might however want to be extra careful with OXEN as it seems that there might be a hidden trojan/virus inside the client as some users are reporting suspicious activity after installing the wallet!